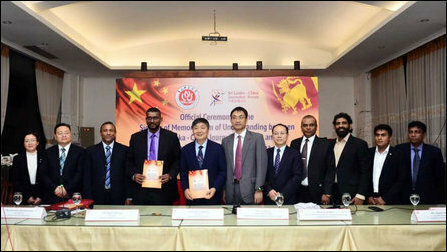 The Chongqing Normal University (CNU) in China is promoting 20 annual scholarships for carrier journalists through the organisation known as Sri Lanka China Journalist’s Forum (SLCJF). A Memorandum of Understanding signed between the CNU President Prof. Zhou Zeyang, and Nalin Aponso of the SLCJF outfit mentions the Belt and Road Initiative as the main platform for the scholarships. Mr Aponso is also the Public Relations Manager of the ‘Sri Lanka’ Port Authority. The MoU was signed at the presence of Chinese Embassy officials and the representatives of the Confucius Institute at the Faculty of Humanities of the University of Kelaniya at an event held in Colombo on 12 December. The SLCJF, established in 2001 has been promoting China with Sinhala language periodical ‘Mahajana Cheenaya’ (People’s China), several exhibitions for educational institutions in China and arranging trips to China. The West and India have primarily influenced the Colombo-centric media industry in the island since the European colonial times. There has been several US Embassy and Indian High Commission backed journalistic programmes, scholarships and study tours as well as educational institutions of the respective countries and alliance partners serving the same agenda along with a host of NGOs operating in Colombo. Although the Chinese have sought to influence the media industry in the island through the outfits such as the SLCJF for more than two decades, the media impact of their propaganda orientation has been ineffective in countering the journalistic influence of the West and India. For example, an investigative report by Maria Abi-Habib, the correspondent of the New York Times based in New Delhi, which was published in June 2018, has emerged as the most referenced journalistic piece propagating bad public opinion to China's Belt and Road Initiative (BRI). The article, titled “How China Got Sri Lanka to Cough Up a Port”, exposed the lease-for-debt swop for Hambantota port as the default reference case across the globe for China's “debt-trap diplomacy”. Even the SL Prime Minister Ranil Wickramasinghe, seen as a pro-US politician, had to defend the role he played in the deal following the publication of the article by the New York Times. In response, the Chinese also went to the extent of seeking the help of the High Commissioner of Pakistan in Colombo, Dr Shahid Ahmad Hashmat, to coach the SL Army and Navy commanders, who had become suspicious on the eroding ‘sovereignty’ of genocidal Sri Lanka. Dr Hashmat was lecturing SL Navy Commander Vice Admiral Sirimevan Ranasinghe and SL Army Commander Lt. Gen. Senanayake along with other SL military officers on “A New Vision for Regional and Global Connectivity and Economic Cooperation” making a case-study on China Pakistan Economic Corridor (CPEC) at an event organised by SL Association of Retired Flag Rank Officers on 30th November. China's state radio, previously known as Radio Peking, launched a Tamil station in 1963. Radio Peking is now known as China Radio International (CRI). The station had earned a reputation in the past as the native Chinese broadcasters who gained proficiency in Tamil were mainly focusing on conveying Chinese cultural programmes and focused on interactions with the Tamil audience in South Asia. However, in recent times, the CRI Tamil station has become more BRI propaganda-oriented, and its interactions with the island are not Tamil-centric as it was in the past. Apart from the special programmes conveying BRI (ஒரு மண்டலம் மற்றும் ஒரு பாதை) propaganda, the CRI also covered the recent archaeological excavations that unearthed old maritime Silk route heritage artefacts at Allaip-piddi (அல்லைப்பிட்டி) in Ooraath-thu'rai (Kayts), an islet off Jaffna. The CRI Tamil service ridiculously rendered Allaip-piddi as “allal-pidi” (அல்லல்-பிடி), which is much worse than BBC English pronouncing Moothoor (மூதூர்) as Muttur (மட்டர்), Tamil journalists in Jaffna commented. Those among the Eezham Tamil journalists, who realise the virtues of independent journalism must educate the broader audience of Eezham Tamils to keep away from the influences coming through scholarships and programmes of the powers that abetted the unitary state of genocidal Sri Lanka in the war, they further commented. 02.12.18 USA, China agree on 90-day ceasefire on trade war, India to ..
21.11.18 South Asian journalists introduced to US agency-concept in m..
16.08.18 New Delhi with ‘cultural presence’ not concerned about Chine..